“There’s no place like home…” is certainly true. This can feel especially poignant for those with Alzheimer’s, who are reluctant to leave a beloved spouse, pets, and the familiar comforts of home. 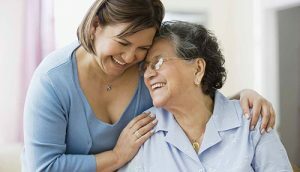 It’s also true that as Alzheimer’s and dementia-related conditions progress, it becomes increasingly difficult to keep a loved one well cared for, even with full-time home care in place. There is no single answer to this question because every situation is different. However, we can shed some light on the differences between the two. Because most families are unable to accommodate that level of care, many Alzheimer’s patients end up in-home care settings that unknowingly hinder, rather than promote, their well-being. Eventually, they’re transitioned into a memory care facility in crisis, creating a more traumatic experience for everyone involved. Consider the different levels of care offered in Alzheimer’s in-home care and memory care facilities. Fact-based understandings of Alzheimer’s disease and how it progresses. A realistic awareness of the quantity and quality of care required, which exponentially increases over time. An assessment of current health conditions (if any) and those likely to develop with age, personal/family medical history, and/or in response to dementia-related side effects. Awareness that home-based care plans require some form of respite care from caregivers who are trained in memory care. Transitions significantly diminish the well-being of those with mid- to later stages of Alzheimer’s, including big moves and even the ins-and-outs of getting to/from various medical appointments, etc. In almost all cases, the ideal memory care model is one that provides the required level of support and care in the home, if desired, during the early stages of the disease. Transitions from Alzheimer’s in-home care to memory care facility should take place while your loved one has some level of authority regarding decisions and timelines. Just this year, the Alzheimer’s Association posted an incredible document titled, Alzheimer’s Association Dementia Care Practice Recommendations, published as a supplemental issue of The Gerontologist. This includes some of the most up-to-date research findings, which support the following comparisons and recommendations about Alzheimer’s in-home care and memory care facilities, and at what point a transition is best. After the shock of the Alzheimer’s diagnosis wears off, it’s no time to pretend “business as usual.” It’s time to rally the troops, ensuring everyone understands what this diagnosis means in a relevant timeline specific to the age/medical condition of your loved one. The earlier the diagnosis the better because an early diagnosis allows the individual to have more autonomy and empowerment in expressing ideas, opinions, and desires. The collective feelings, fears, anger, grief, etc. about the situation. Appreciation for the reality that we’re better informed and better equipped than ever to provide healthy, active and as-independent-as-possible lifestyles for those with Alzheimer’s or dementia. The importance of being proactive about researching all long-term care options. Dementia is a progressive disease, almost without exception; some changes happen unpredictably and seemingly overnight, so preparation is everything. Prospective timelines for the transition from Alzheimer’s in-home care to memory care facility. Researching respite care options, knowing respite caregivers need to be well-versed in memory care in the more challenging stages, times of day, etc. Feeling nervous about the conversation? Read, our Guide for Talking For Talking to a Loved One About Memory Care. While home care does have it’s perks, particularly around the initial diagnosis phase, there are serious challenges when it comes to providing exceptional memory care for your loved one as well as providing the medical care s/he requires now and in the future. It is critical to consider the challenges inherent in a long-term Alzheimer’s in-home care plan. If your loved one lives alone, there is almost no circumstance where home care trumps memory care. The research is very clear that personalized, social engagements are not only good for those with Alzheimer’s, they actually slow down the disease’s progression. The social sphere of someone with dementia shrinks considerably as the disease progresses; if that person lives alone, interactions with a handful of rotating caregivers, is simply not enough. Even an individual who lives with a spouse or family members nearby cannot derive the same level of social interactions – let alone art classes, music exposure, gardening, etc. that takes place via direction or facilitation of a memory care expert. Any medical change, emergency, illness, medication reaction etc. requires transport from home to the doctor, hospital, urgent care, etc., and these disruptions to the norm are very disturbing to the Alzheimer’s patient. The more memory and medical care are provided via long-term continuums, the better the overall outcome is for Alzheimer’s patients. High-quality memory care facilities have nurses on-site, available around the clock, and the large majority of residents’ medical conditions and pharmacy needs are managed onsite. This enables a more relaxing, consistent routine for residents, all provided by familiar faces. If you decide to care for a loved one at home until you can no longer manage, you’re in a precarious position. The inevitable transition from your home into memory care may be extremely difficult for the one with Alzheimer’s and much more traumatic for you. You may put yourself and key family members at risk for burnout, continually avoiding the transition until your/their health and well-being are compromised. Your loved one’s Alzheimer’s may, ironically, become “worse” or more progressed by not having skilled memory care in place earlier on. Read, When to Move to a Memory Care Facility, and learn about the signs indicating when moving to a memory care facility is the right move. It’s never too early to explore memory care facility options. In fact, touring them early is not only helpful for narrowing down prospects, it’s a tremendous resource during your overall adjustment phase. Through these tours and interviews with memory care experts you and loved ones have access to expert information, education, recommendations, etc., to help you acclimate to your new situation. Instead of thinking of memory care facility tours as a, “we always said we’d never…” scenario, think of them as an empowering way to learn all you can about memory care and your options without any obligation. This checklist, Questions to Ask When Visiting Memory Care Communities, provides a helpful framework for your conversations with memory care administrators and staff. Contact The Memory Center to learn more about your options.